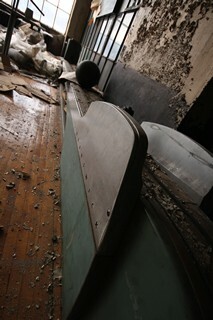 The Hill Valley Lace Company, whose operations spanned two centuries of American history, ended production in 2002. 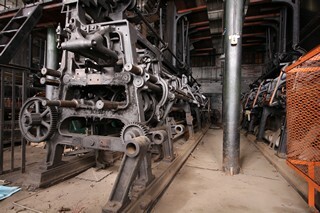 During its heyday in the early 20th century, Hill Valley Lace employed over 1,400 people and was the world’s largest producer of Nottingham lace. 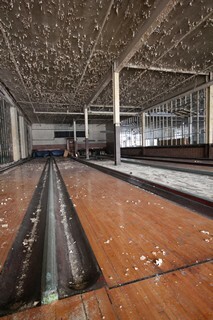 It had bowling alleys, a gymnasium, a barber, a fully staffed infirmary, and owned its own coal mine and cotton field. 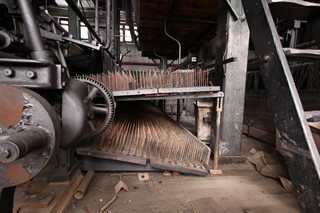 Founded in 1897 in Northern, PA, the company used looms that were made in Nottingham, England, stood two and a half stories tall, were over 50 feet long, and weighed over 20 tons. During World War II, the company expanded its production line to include mosquito and camouflage netting, bomb parachutes, and tarpaulins. After the war, the company returned to producing cotton yarn, vinyl shower curtains, and textile laminates for umbrellas, patio furniture, and pool liners. In recent years, the number of employees dwindled to around 50 people, with annual sales averaging $6 million. As mechanized looms replace manual ones, Hill Valley Lace joins the ranks of craft-style textile manufacturers shutting their doors.